I brought this sweater out at Rheinbeck on Sunday. It's hugably soft and I can tell will get a lot of wear this winter. Pattern is being worked on and a full reveal will come soon! As always, thank you for popping over my blog and enjoying my knit rants - and sticking with me through my baby hiatus! You guys rock. Anyway, I won't let my dyelot woes interfere with my pure excitement of finishing this sweater! I can't wait to show it off. And yes, I've decided to write it up - including needing an extra skein! No one shall suffer my mistake! You're very welcome. Congratulations, Anne Marie! I hope you make lots of SOCKS! Hope everyone else has casted on or are we all in this together on Dec. 24th? One of the greatest pleasures of being a knitter is the ability to create gifts for the ones we love. Whether it's a hat or a shawl or even a small bootie, using our hands to create things always adds that extra special touch. Jean Moss of Sweet Shawlettes does it again with her newest pattern book, Great Little Gifts to Knit. 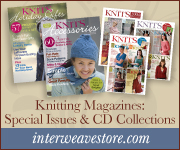 She has designed 30 wonderful patterns that are sure to please everyone on your gift list. As we get into October I am reminded that there are only 85 days left to knit Christmas gifts and even less for those Hanukkah gifts! It's the perfect time to whip a book like this out and cast on. The book is split into 4 sections: Baby, Hers, His and Home. OF course with a little guy now in my life I was really interested in the Baby section. My favorite of the patterns is the Whoopla bean bags! James loves to play with all things soft and what's better than these? It's the perfect project for trying out intarsia for the first time as the small squares are truly forgiving! In the Hers section, you know I love me some leg warmers! And with two balls of Rowan Big Wool these are your Dec. 24th, 11:30pm, almost forgot to make my sis something (or sis in law for me) kind of project! In the His section I was all about the gutiar strap! I love that it doubles as a belt just incase you want to switch it up. It's a great piece for your favorite rocker. Which reminds me, I told my husband that we SO have to get James some guitar lessons once his fingers are up for it. Seven months, too soon? Lastly, in the Home section I was all about the placemats! I often think about how nice it would be to have some knitted placemats and how truly easy they are to make! I'm glad she included them here. It really is the perfect thing for stash busting and everyone could use them. All the patterns are clearly written and easy to follow and with an appendix handy for those 'what does that SSK' mean again moments. And of course what's a Grand Finale without a giveaway! Leave me a comment about what you're looking forward to knitting as a gift this holiday season and I'll pick a winner on Thursday Oct. 3rd! Remember you can grab a copy of Great Little Gifts to Knit for you or your favorite knitter on Amazon! Taking a part of Soul Mama's Moment - A Friday ritual. A single photo - no words - capturing a moment from the week. A simple, special, extraordinary moment. A moment I want to pause, savor and remember. Things are progressing smoothly with my color block sweater which I now refer to as Kendi. When last I left you I was waiting for my colors to arrive, now I am just about to cast on for the 2nd sleeve. And taking the mother of all knitters (EZ's) advice I started with a sleeve. Sleeves work well as a very large gauge swatch. You can double check your gauge without committing too much to the project. Good thing too because I was about a quarter of the way into the sleeve before I decided to rip back and make it a tad smaller and the increases a tad quicker. As for the front, I really enjoy how the neutral tones down the bright colors. Before I started that section I really wondered if it was going to look too obnoxious. The top really balances it all out. Remember when Juliet was huge? It was a time just before Ravelry where you would see it pop up on knit blogs and become it's own form of viral. At the time the designers went by Zephyr Gals and this to be sure was a huge hit for them. I remember the knitting being pretty easy but the ribbon for the buttons was a pain in the toosh! I wasn't confident on how to attach the ribbon and really just stitched it where I could. It held for this photo but wasn't all that awesome when I wore it IRL. I always had to adjust it to make sure it wasn't going to show. This sweater is pretty classic and from the looks of it on Ravelry, this pattern is still going strong. Not to digress but, this shot was taken at one of my old Hoboken apartments. A real crap hole, I remember having mice and roaches... yuck! BUT it was one block away from the yarn shop and across the street from Boston Market (which is now a 7-11!) So while I was slumming it for sure, it's location couldn't be beat. Not to mention, my husband proposed to me in that apartment! As I'm getting back to the swing of things it's time I brought back Friday posts, too! Remember my Flashback Fridays?? I love digging out old sweaters/projects for you guys to see. Gives them a little time in the sun again, so as I line a few of those up I thought in the mean time a Friday Links post would do! I've been thinking a lot about my photography lately. Really on how to make my shots better but also how to make it easier to get the shot from the camera to the blog. I don't have oodles of time anymore and I need to fine the easiest way to get them uploaded and processed. I've even contemplated getting the new Nokia Lumia 1020 (14 megapixals! It's more than my SLR right now!) but I don't have AT&T. My cameraphone isn't a slouch but still it's not all that great either (see above). It is a talent to get the right shot. So much goes into a photograph. Where should I stand? Where should I put the subject in my frame? How much light do I need? How can I get a blurred background? What equipment should I buy? Well below are a few places that haven given me some insight into all that... and honestly the big take away: Just experiement! Of course a Pinterest search of Photography will give you all sorts of good ideas and tips! PS. If you recoginze the above sweater then you'll be happy to know it's revision is almost done!